On January 27, 1972 the Minnesota Vikings swung a deal with the New York Giants that brought QB Fran Tarkenton back to the team he had started his career with, at the cost of three veteran players and two high draft choices. The Vikings received Tarkenton for QB Norm Snead, WR Bob Grim, FB Vince Clements, and the first draft pick for 1972 as well as the second-round choice for ‘73. Under Head Coach Bud Grant since 1967, the Vikings had won four straight division titles through the ’71 season, advancing to the NFL Championship in 1969 before losing to the AFL’s Kansas City Chiefs in the last pre-merger Super Bowl. The team had a consistently outstanding defense and gave up the fewest points in the league in 1971. The offense, however, was far less impressive and an upgrade at quarterback was considered to be a significant need. Joe Kapp,a fiery leader which offset his weaknesses as a passer, enjoyed the most success but was gone due to a contract dispute after the 1969 season. Gary Cuozzo had seen the most action since then, but he could not match Kapp as a team leader and his skills were no better than adequate. Norm Snead was brought in to provide competition but it was Bob Lee, a backup who handled the punting, that started in the Divisional-round playoff loss to the Cowboys. Critics insisted that the stodginess of the offense made it difficult for any quarterback to succeed. The 6’0”, 190-pound Tarkenton, a resident of Atlanta who starred at Georgia and was just short of his 32nd birthday, spent his first six seasons with the Vikings after they drafted him in the third round in their initial season of 1961. He quickly took over as the team’s starting quarterback and played with a distinctive, scrambling style that was exciting but became a source of conflict with Head Coach Norm Van Brocklin. Tarkenton was twice selected to the Pro Bowl during that period, but after a promising 8-5-1 finish in 1964, the club as a whole moved backward. Both Van Brocklin and Tarkenton were gone after the ’66 season, and the scrambling quarterback was chosen to four consecutive Pro Bowls with the Giants from 1967 through ’70, when the club posted a 9-5 record and nearly won the NFC East title. Things soured between Tarkenton and the Giants in 1971. First, he upset team president Wellington Mara when he briefly walked out prior to the first preseason game due to a contract dispute. As the team dropped in the standings in 1971, finishing at 4-10, Tarkenton expressed the desire to play for a contending team. The Giants were 33-37 in five years with Tarkenton starting at quarterback, and his last season with the team was easily his worst as he threw just 11 TD passes against 21 interceptions. New York’s Head Coach Alex Webster expressed the hope that the trade would help the team in 1972 and beyond, thanks to the package of veterans and draft picks received. Norm Snead had played eleven seasons in the NFL, coming into the league at the same time as Tarkenton. A 1961 first-round draft pick by the Washington Redskins, he started every game as a rookie. Big at 6’4” and 215 pounds and a classic drop-back passer with a strong arm and slow release, Snead showed early promise but was traded to the Eagles in a celebrated 1964 deal for QB Sonny Jurgensen. Following seven up-and-down years in Philadelphia, he moved on to the Vikings in ’71 and was used sparingly. Bob Grim was coming off of his fifth, and easily best, year with the Vikings. He more than doubled his production of the first four seasons with 45 catches and 691 yards in ’71, and earned selection to the Pro Bowl. Vince Clements was Minnesota’s fourth-round draft choice in 1971. He missed most of his senior year at Connecticut due to a knee injury and left the Vikings after reinjuring the knee during the preseason. However, he had expressed an interest in returning for ’72. The expectation that adding Tarkenton would bring a championship to Minnesota was dashed in 1972 when the team finished third in the NFC Central with a 7-7 record. While Tarkenton provided the needed upgrade at quarterback, and had an excellent target in Pro Bowl WR John Gilliam, the running game lacked a back with breakaway ability, and the vaunted defense became vulnerable against the run. The situation improved greatly in 1973. Rookie FB Chuck Foreman was productive both running and catching the ball and the defense, with key players healthy, was strong again. The team won the NFC Championship before falling to the Dolphins in the Super Bowl. It was the first of three trips to the Super Bowl in four years, although they all ended in defeat. 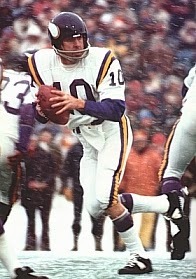 Tarkenton was a consensus MVP selection in 1975 and was chosen to the Pro Bowl three times in his second stint with the Vikings. He led the league in completions on three occasions, completion percentage twice, and passing yards and touchdown passes once. In 1978, his last season, he achieved career highs in pass attempts (572), completions (345), and yards (3468), although also in interceptions (32). Upon his retirement, he was the NFL career leader in rushing yards by a quarterback (3674) as well as pass attempts (6467), completions (3686), passing yards (47,003), and touchdowns (342). The Giants were 8-6 in 1972 and Norm Snead (pictured at left) had an outstanding year as he led the NFL in completion percentage (60.3) while throwing for 2307 yards and 17 touchdowns against 12 interceptions. He was named to the Pro Bowl. But both Snead and the Giants collapsed in ’73, with the team dropping to 2-11-1 and the quarterback leading the league with 22 interceptions. Snead was traded to the 49ers during the 1974 season and returned to New York as a backup in his final season of 1976. Bob Grim caught just five passes in 1972 but had a total of 65 for 1059 yards and four touchdowns in 1973 and ’74 before moving on to the Bears and returning to the Vikings in 1976. Vince Clements played for two years with the Giants and rushed for 435 yards and added 24 pass receptions for another 247 yards, but appeared in just 16 games due to nagging injuries that ultimately curtailed his career. The two draft choices obtained for Tarkenton were used to take DE Larry Jacobson from Nebraska with the 24th pick in the first round in 1972 and Michigan State LB Brad Van Pelt in the second round of the ’73 draft. Jacobson started nine games as a rookie but lasted just three seasons and had little impact. 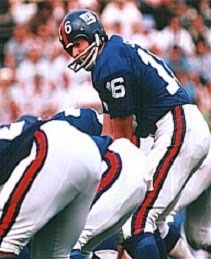 Van Pelt was far more successful – and was the player obtained through the Tarkenton deal that was most useful to the Giants for the longest amount of time – playing 11 seasons with the club and gaining selection to the Pro Bowl five straight times, from 1976 to ’80. For the Vikings, the acquisition of Tarkenton did help the team and played a significant role in advancing to three NFC Championships. For the Giants, the deal brought only short-term relief in a slump for the franchise that started in 1964 and lasted until 1981.